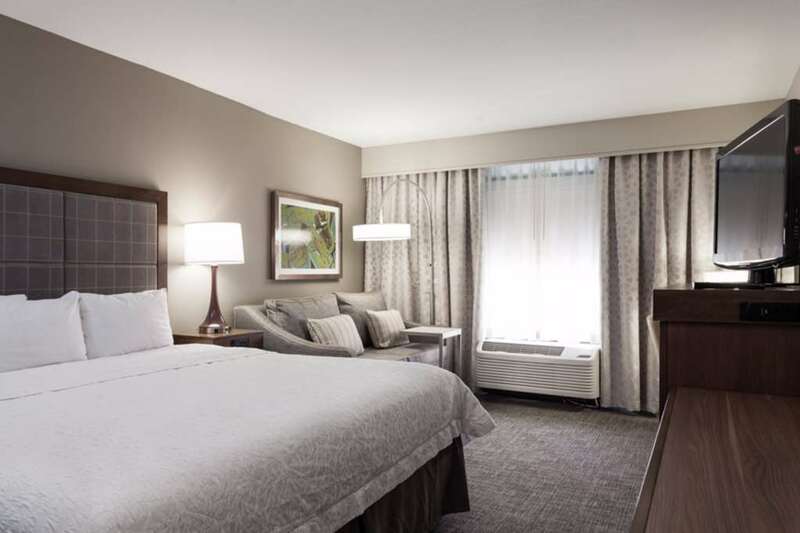 Centrally located in Grapevine Texas and the Dallas Fort Worth Metroplex the Hampton Inn - Suites Dallas-DFW Airport North/Grapevine hotel places you within the grasp of historical Grapevine vibrant Dallas or cowtown Fort Worth. Whether your intentions are a business meeting weekend wedding family vacation or romantic escape our Texas hotel can help you either wind down or wire up. The upscale Highland Manor Lobby in our Hampton Inn - Suites Dallas-DFW Airport North/Grapevine hotel of Texas is reminiscent of a traditional club designed with rich warmth and character. Cozy up to the fireplace to finish that novel or send that proposal by e-mail with wireless internet access. Savor a cup of coffee from the Breakfast Room or soothe tired muscles in the indoor heated hotel swimming pool. Any Road Warriors joining our Hampton Inn - Suites Dallas-DFW Airport North/Grapevine hotel in Texas enjoy a business-friendly environment complimentary high-speed internet access a business center complete with computer/copier/fax transportation to and from DFW Airport meeting space laundry/valet service and hotel work out facilities. Treat yourself to one of our King Bed Whirlpool Rooms. Spread the family out in one of our roomy hotel suites. Exhale by visiting the art museums nearby Hampton Inn - Suites Dallas-DFW Airport North/Grapevine hotel or sampling at a local winery. Lose your sense of time shopping at the Grapevine Mills Mall or novelty shops in historic Grapevine Texas. Satiate your appetite at one of the oodles of restaurants nearby Hampton Inn - Suites Dallas-DFW Airport North/Grapevine hotel of Texas. Wherever you need to be for whatever purpose make the Hampton Inn - Suites Dallas-DFW Airport North/Grapevine hotel in Texas your hub in the DFW metroplex. We love having you here at the Hampton Inn - Suites Dallas-DFW Airport North/Grapevine hotel in Texas.